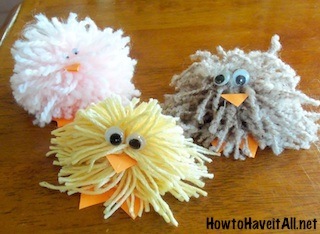 Fuzzy Chicks Easy Kids Craft! You are here: Home / DIY / Easy Craft Projects / Fuzzy Chicks Easy Kids Craft! This is a fun and inexpensive craft that children will enjoy for Spring or Easter. 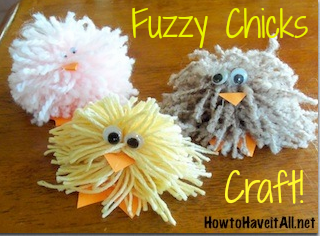 This fuzzy chicks easy kids craft can be made in a variety of colors and sizes. Just use whatever supplies you have on hand! Fluffy and thick yarn works the best though. 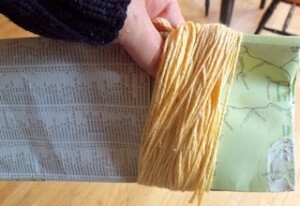 Wrap the yarn around cardboard or a thick pad of paper. I used a map that I had laying out that was about 4″ wide. Wrap the yarn several times to make the chick nice and fluffy. Slide the yarn off the paper while keeping it in a loop. 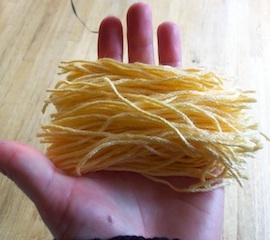 Cut each end of the yarn to make a pile of yarn strands that are approximately equal in length. 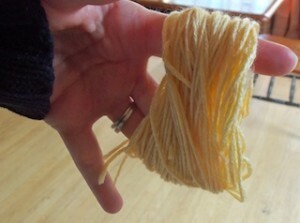 Once you have a nice pile of yarn strands, take a one strand and tie it around the middle of the stack. 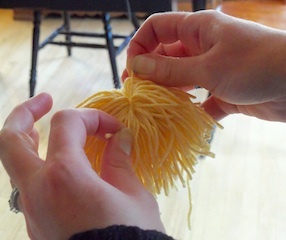 Tie the knot really taught to make the yarn puff up into a ball. You should end up with a cute little yarn pom pom! Use the glue gun to glue on the googly eyes. Cut a small triangle out of the construction paper for the beak and glue that on. For the feet, I cut out two large triangles. 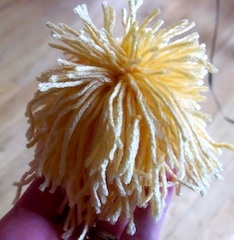 I glued them together and glued them to the pom pom. SO cute!!! Looks like something my kids would really enjoy making!! I’ve been looking for new ideas. These are adorable little chicks. Thank you for sharing.